There’s so much drama going on with this D.C. bald eagle family that you’d think feathers are about to fly on some sordid daytime TV show. Now, there’s a new twist in the avian affair. Nearly four weeks after having flown the coop, bald eagle Justice has returned to the nest in Southwest D.C. But, as of Wednesday afternoon, Liberty and Justice have not been seen together. Justice was last seen at the nest the morning of Feb. 9 with Liberty — his mate of 14 years. Over the next week, Liberty laid two eggs, but Justice was nowhere to be found. Lady Liberty then entertained multiple suitors, including one dubbed “Aaron Burrd.” It was another bird that Liberty ultimately took off with — called M2 — on Feb. 23, fully abandoning the eggs. 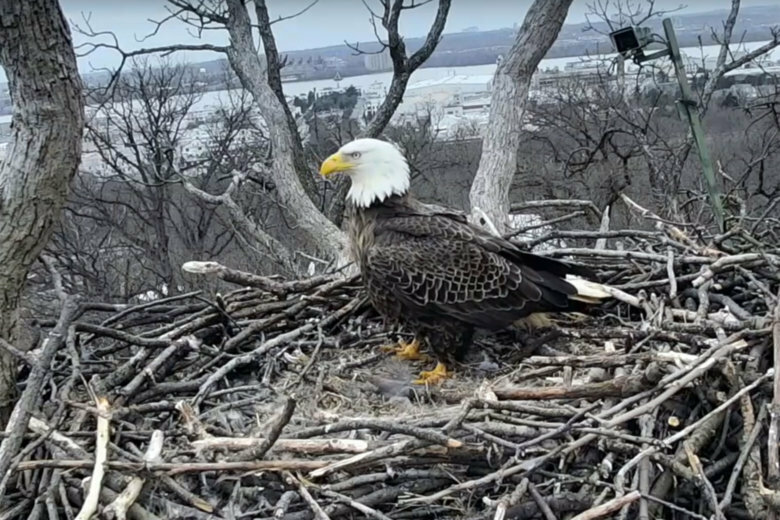 “There’s no possible way those eggs would hatch at this point,” Tommy Lawrence, managing director with the Earth Conservation Corps, which maintains the eagle webcam that broadcasts the doings in the nest, told WTOP last week. “They’ve been left in the cold for way too long, and so those eggs are gone for now,” Lawrence said. The Earth Conservation Corps said in a release Wednesday that previous nests have had similar experiences with missing males, and similar events. As it stands now, Justice could now fight off M2 to reclaim the nest. Or, M2 could defeat Justice. Either way, eagle-eyed nature enthusiasts are watching. See a live feed of the eagle cam below. WTOP’s Will Vitka reported from Washington.